But that finger, oh man it was driving me mad with the itch! It was so freaking itchy, like 50 spider bites itchy, a bush of stinging nettles itchy, crawling scabies itchy, cheap laundry detergent itchy, chop my bloody finger off now itchy. I tried to relieve the itch by rubbing it on my jeans, scraping it along the ridges of a pill bottle cap, dragging it back and forth on the carpet – none of which worked. The cause of the itch, just another side effect of dear diabetes. After more than 24 years of poking my finger with a lancet device, multiple times a day, sometimes as high as 12-14 times a day, my finger had had enough. Last week I started noticing that it wasn’t healing as quick as it should. 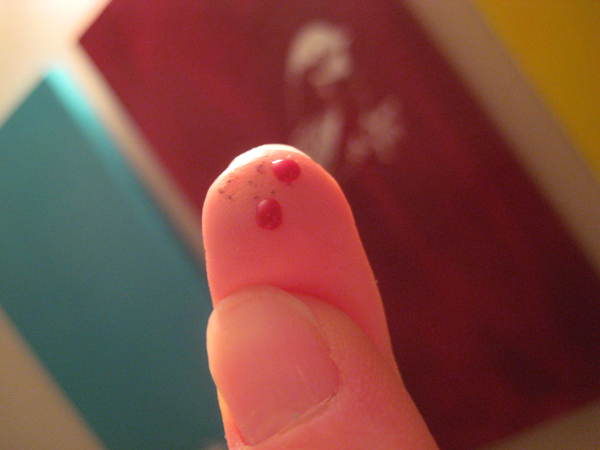 In fact it still produced droplets of blood, with just a slight squeeze of the tip, hours after being poked. I kid you not, I was starting to resemble Bugs Bunny drinking after being riddled with ammo by Elmer Fudd’s rifle. A fountain display of blood, that’s what I was becoming. It’s my own fault really. I mean, I’ve got 10 fingers to choose from, but really only ever use four. Early on, when all my fingers were still tender, baby skin smooth digits, I had decided that my two ring fingers and two middle fingers were to be my go-to fingers. My pointy fingers always bruise after being poked, my pinky fingers are far too petite to be poked, and my thumbs, while they’re good and fleshy, take forever to clot, seriously, it’s like the ebola of the thumbs after they get poked. No thank you. In my desire to regain some semblance of balance in my life, I chose to shut down my computer tonight, put the books away, put the work away, and sit with my husband and watch a movie. Movie viewing in our household is a favoured pastime, but as with many activities this last month or so, has also suffered. Tonight, that was to change. The lesson learned: Should I really be shutting down??? This entry was posted in Diabetes and tagged blood testing, diabetes side effects, finger calluses, finger itch, Type 1 diabetes. Bookmark the permalink.